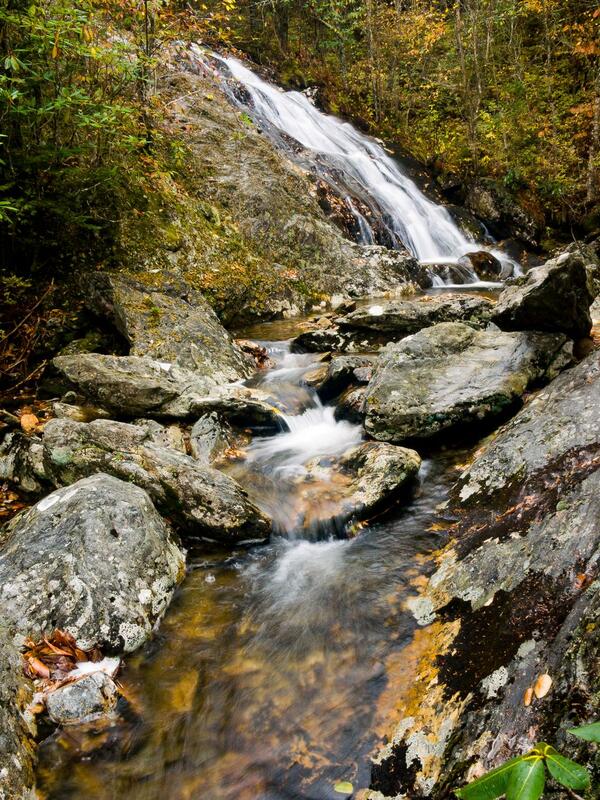 It's not tall, but the spectacular high-elevation scenery and crystal-clear stream make up for that at this falls. It's a steep cascade that is best viewed during moderate to high water. From the intersection of the Blue Ridge Parkway and NC Hwy. 215, follow NC 215 North for about 0.4 miles to the large parking pulloff on the left. Park here, but be careful - there's usually a large rut beside the road. The NC Mountains to Sea Trail crosses the road just down from the parking area. The NC Mountains to Sea Trail crosses Hwy. 215 just north (downhill) of the parking area. Take the trail on the left, downhill (West). You'll reach the Wilderness sign and cross Bubbling Spring Branch. If the water is too high to rock-hop here, expect to get wet on this hike. The NC MST continues on the other side of the creek, but go left, through a campsite under the spruces, following a faint manway upstream. The path crosses the creek several times - and the crossings can be tricky. After less than 1/2 mile or so the trail kind of merges with the creek and arrives at the Lower Waterfall on Bubbling Spring Branch. The upper falls is just a short distance upstream from the lower falls. From the far side of the pool away from the lower falls, a faint path leads steeply uphill through the rhododendrons. The path is steep and overgrown, and passes a safe distance away from the brink of the lower falls. Don't approach the top of the lower falls - the rocks are very slippery! It then passes just below a neat rock bluff. After a few more yards it comes out at the stream well above the lower falls. Continue rock-hopping up the stream/path to the base of the upper falls.